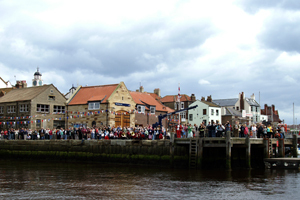 The second selection of photographs captured as the William Riley made its arrival from Staithes into Whitby harbour. 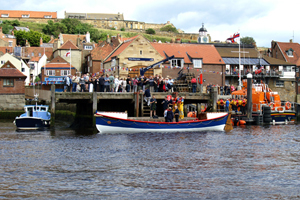 We followed the boat as it made its way into Whitby and were surprised by how many people had gathered around the piers and harbour, no doubt swelled by those who had come to see the annual lifeboat weekend. 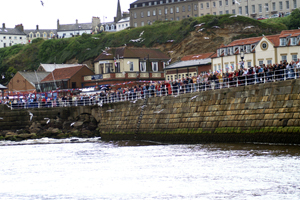 The crowd of onlookers started at the outer most part of the pier and went the full length of the harbour up to the swingbridge. 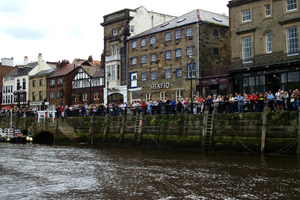 Within the harbour the crowds cheered the William Riley and her merry crew after they had travelled 60 miles in just a such a short space of time. 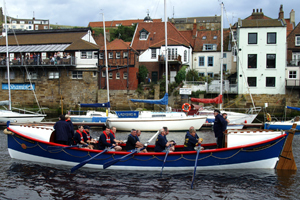 The boat moored alongside the lifeboat pier and the rowers joined those gathered to celebrate the arrival and the blessing of the fleet. 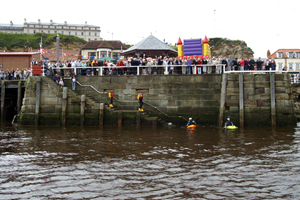 It was the perfect end to the 2008 lifeboat weekend, one that will undoubtedly be held in high regard for many years to come.